Best of show for those who want a fancy halter to take the show, fancy stitched & rolled throat. 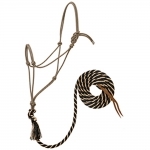 The Bosal style nose with knots on each side gives you greater control. 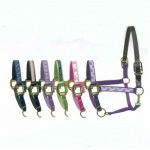 Durable nylon with adjustable crown & chin, throat snap & plaid overlay on nose & crown. 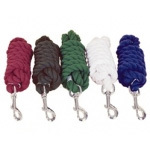 Hand-tied from 5/16" polypropylene 16-strand diamond braided rope of medium-firm lay. 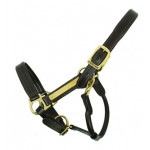 Features brass plated hardware, box-stitching & oblong buckle holes, small horse or weanling draft. 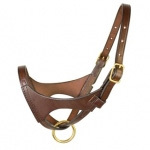 Features oblong buckle holes, box-stitching at stress points and a comfortable rolled throat. Heat-sealed oblong buckle holes, box-stitching at stress points and true-to-fit-sizing. 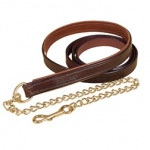 This simple, non-adjustable design features a comfortable rolled throat and brass plated hardware. Solid brass 225 snaps with an oil rubbed finish, measure 5/8" wide x 10' long. Premium polypropylene lead has a soft, broken-in feel, a non-rust snap, in tons of colors, 5/8" x 10'. 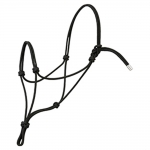 Hand-tied from 5/16" polypropylene 16-strand diamond braided rope of medium-firm lay that holds its shape.